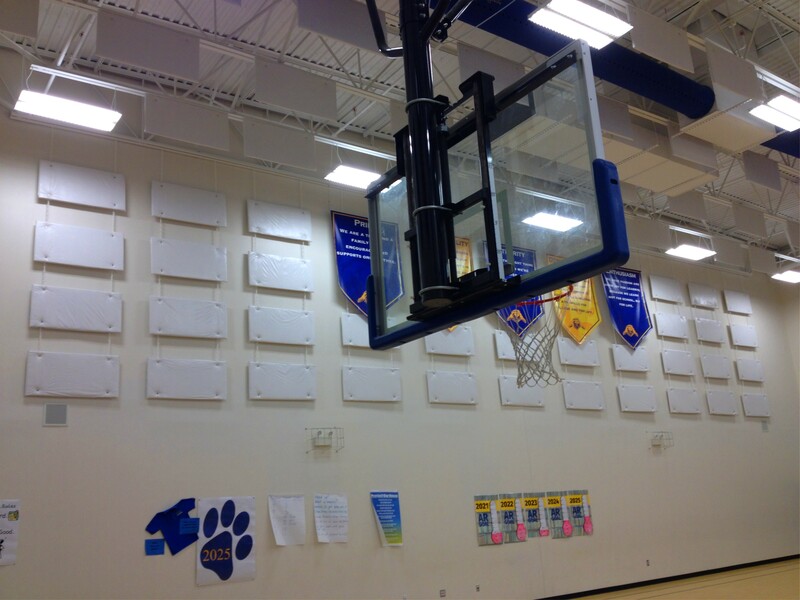 Cloudscape® Baffles are a wonderful product! 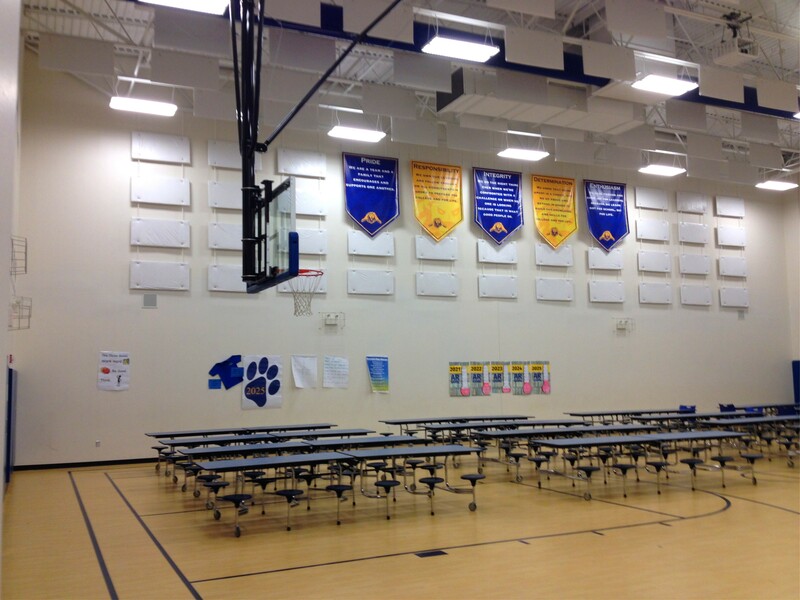 This batch of baffles was installed in a middle school gymnasium/multi-purpose room by one of our dealers. Note how they were installed not just in the ceiling, but also on the walls by ‘chaining’ the baffles together. 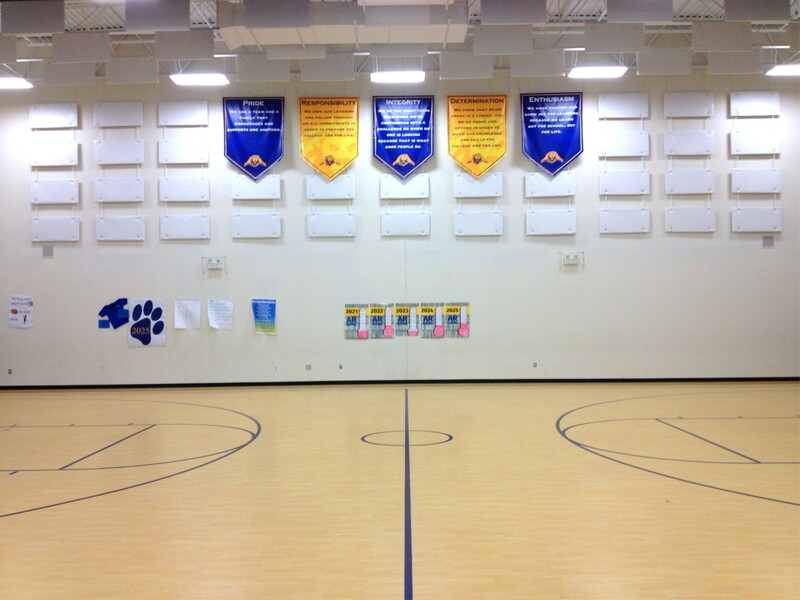 Most of the time we recommend hi-impact Sonora® Panels for the walls in school gyms such as this, but with a little ingenuity baffles can also get the job done! Baffled by Acoustical Ceiling Treatments? Acoustics First® adds more ways to get ‘Baffled’ and improve large room acoustics. Acoustics First® has ‘amped up’ the Cloudscape® line of ceiling baffles. 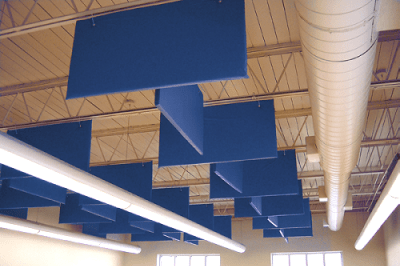 These acoustical baffles reduce reverberation in applications such as gymnasiums, auditoriums, performance venues, theaters and restaurants. They can be suspended from open truss and pre-engineered suspension systems or alternatively mounted direct to a roof deck or wall. In addition to the standard 4’x2′ x1.5″ PVC encapsulated ‘echo-nomical’ baffle, Acoustics First® has expanded the selection to include three alternate finishes. If you wish to upgrade the size of the standard PVC Cloudscape® Ceiling Baffle, we now have a 2″ thick option available in sizes up to 4’x10′, with some limitations. If you wish to upgrade the finish, you can choose the durable rip-stop nylon sailcloth, product code CSBF2S with 9 color choices. 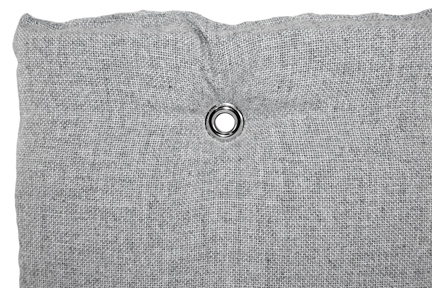 If sailcloth doesn’t ‘float your boat’, choose the fabric encapsulated Cloudscape® Baffle. The CSBF2F is encapsulated in a sewn Guilford of Maine® FR701® fabric and will coordinate with the Sonora® ridgid acoustical wall panels. The acoustical ceiling baffles are extended even further with an offering of exterior grade fabric for outdoor applications. 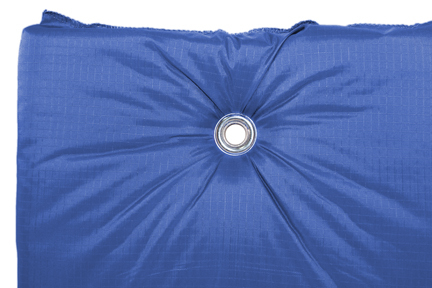 Overall, you now have 4 choices of baffle configurations, more sizes and 96 finish options. Additionally, all the 2″ thick options use environmentally friendly Ecose® glass fiber. For more information or to receive a quotation, please contact Acoustics First® via email, info@acousticsfirst.com, or call Toll Free 1-888-765-2900 (US & Canada).